After months of meticulous dabbing away at decades of dust and grime, a contested cleaning of Michelangelo's "David" is more than halfway done, and experts insist the restoration has improved the marble masterpiece's appearance. Franca Falletti, director of the Accademia Gallery, where "David" draws 1.2 million visitors a year, said Monday at a news conference that work on the statue will be finished by late May, four months shy of the 500th anniversary of the sculpture's unveiling. But tests will continue to explore one problem that emerged in the restoration - an apparent fragility of the statue's ankles, which support more than six tons of dead weight. Right now, Michelangelo's celebration of naked male beauty looks like a youth who emerged from the tub without scrubbing all over. Grimy gray streaks coat parts of the statue, with the inner right thigh and much of his upper right arm still to be tackled. But with roughly two-thirds of the dull patina removed, the statue depicting the heroic youth who did battle with Goliath already is bathed in a new light. Some critics, such as Columbia University's James Beck, alleged last year that the restoration methods were potentially risky. He led an unsuccessful petition drive to persuade Italian authorities to set up an international panel to study the statue's health. Restoration got off to an aborted start when an internationally respected restorer, Agnese Parronchi, quit last year rather than follow orders to use a cleaning method she feared would harm the sculpture. "Working in an already poisoned climate wasn't ideal, but because of my conviction that the method I had to work with was the right one, I had no doubt," restorer Cinzia Parnigoni said about taking Parronchi's place. "The restoration has given uniformity and continuity back to the surface," she said. "I think it's a real improvement." Most of the cleaning involved distilled water, although mineral spirits were used to remove yellowish spots of centuries'-old beeswax. Parnigoni used plaster to fill considerable pitting on the marble's surface that was serving as dirt traps. Parnigoni also wielded a scalpel-like instrument to chip away at what looks like age spots - blotches of sulfate deposits that were first blamed by the experts on pollution but latter attributed to restorations centuries ago. In an unusual step, the customary thick volume documenting the technical aspects of the restoration was published in English, instead of Italian, to make it more widely read in the art world. "We hope this will help avoid the unfortunate polemics like those which occurred in the United States," Cristina Acidini, who directs Florence's main training school for art restorers, said. Helping to pay for the restoration is a Dutch nonprofit foundation, Ars Longa Stichting. Friends of Florence, a U.S.-based foundation, is contributing funds to monitor the statue's condition. 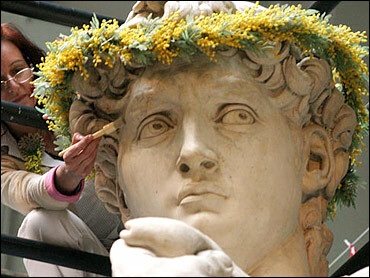 Until 1873, "David" had cast his aloof glance across Piazza Signoria, Florence's main square. But fears about the weather's effects on the statue prompted its removal to the Accademia. Falletti said possible new itineraries for the gallery will be studied to see if they will allow tourists to kick up less dust on "David." Restorations often provide new information about a work's history, and Falletti said experts were able to note how the top of the statue's curls had been re-sculptured a couple hundred years ago, probably after the wavy locks were worn down by rain. The idea of another sculptor laying hands on Michelangelo's masterpiece "makes us shiver," Falletti said. "'David' wasn't always a legend like it is today." To help the legend last, engineers are considering trying to find a similar block of marble to run resistance tests for any future plans in shoring up the weak ankles. However, nothing has been decided.